Some of the tallest waterfalls in South East Asia can be found in Sumatra. The highest are found along the Asahan River. Air Terjun is Indonesian for waterfall. 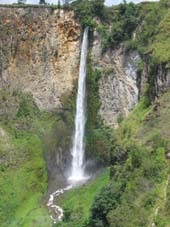 Sipiso-piso waterfall, ('like a knife') 120m high is 45 Kilometers from Berastagi at the northern end of Lake Toba. The water fall is formed by a small underground river of the Karo Plateau and flows out into the Lake Toba caldera. 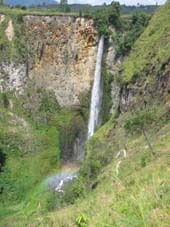 To get to Sipiso-Piso falls catch a local mini-bus from Berastagi to Kabanjahe 2500Rp. At the bus terminal in Kabanjahe catch any bus going to Siantar and ask to get off at Sipiso-Piso. From the main road the falls are 2.5km from the main road. There are becak drivers waiting at the turnoff and will cost 5000Rp to go to the falls. Entrance to the falls is 2000Rp. 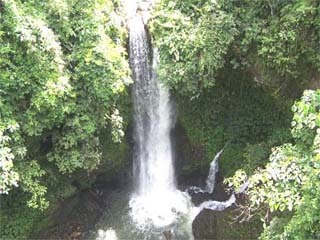 Sipiso-piso waterfall is an excellent location for paragliding. It has been trialed here but unfortunately at this time there is nowhere to hire equipment. 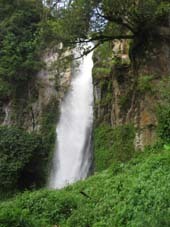 Sikulikap waterfall, around 30m high is 20 minutes from Berastagi. To get there catch any bus from Berastagi going to Medan and ask to be dropped off at Sikulikap. It should cost about 3000Rp for this trip. On the main road there are a series of basic food stalls with great views out over the gorge where the waterfall is located but you are unable to see the falls from there. At the bottom of the hill near the road bridge, on the right there is a path that leads through the rainforest to the falls. Should take about 15 - 20 minutes to walk to the falls. There is a good chance you will see monkeys within the rainforest. The Three Level Waterfall, or Air Terjun Tiga Tingkat is located at Koto Lubuk Hitam village, Cindakia bungus, Teluk Kabung Prefecture, 25kms south of Padang. At an altitude of 600m above sea level. Imbulun Sangir Waterfall - in South Solok West Sumatra is a 15m high waterfall. You can get to South Solok (Seltan Solok) from Padang. Kasang Waterfall - 7 levels - located in the Riau Province of Sumatra, about 5 hours from Pekanbaru, 24km from the village of Taluk Kuantan. Although the whole waterfall is divided into 7 separate falls you can only see a few of the sections from the bridge that is built half way through the falls. On Samosir Island, Lake Toba there is a waterfall just behind Tomok. This is only running during the wet season or after heavy rain fall. There is also another waterfall at the southern end of Lake Toba accessible by boat. Hotels in Tuk-Tuk can arrange a boat cruise or charter a speed boat to take you there. 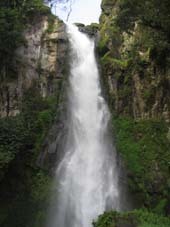 At Siguragura, at the southern end of Lake Toba is the Siguragura Waterfall known as Tiger Falls. 220m high they are part of the Asahan River.